I picked out a few of the flakes which are quite soft in texture. Anybody seen anything like it or got any idea where they might have come off? Thanks Rick G. That just earned me a beer....! I saw the photo Sunday and as I was out on the K yesterday was thinking the same thing. I found the same in my engine oil just last week..... but nowhere near as much as that tho!! Just a few very small bits. I determined they weren't metal as they would break under my finger nail. I suspected they were from the timing chain tensioning guides/tensioner. Will be doing that as soon as I get parts. Thanks Rick G - I have an 8 valve kit here but I need the 16v kit for this ...buggah. Looks like I owe Olaf a Bierre Blonde! Why are those metal flakes not in the oil filter? 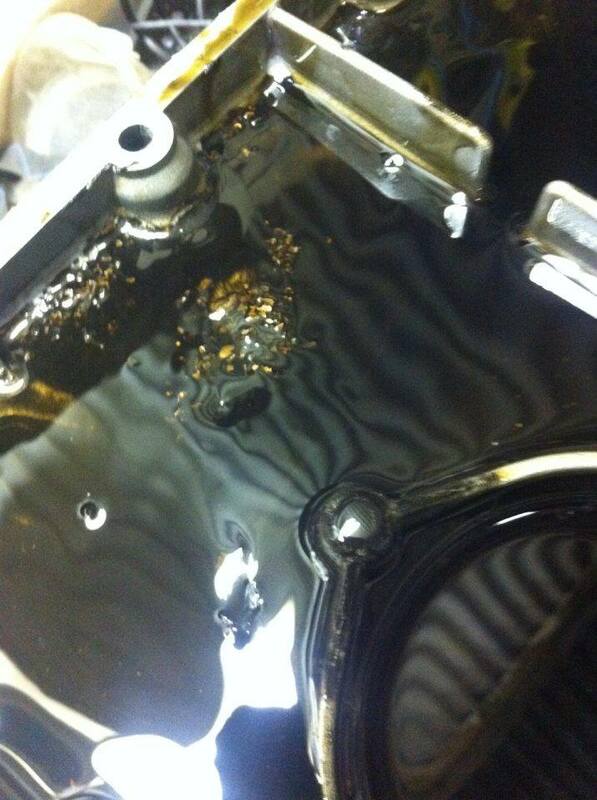 @brickrider2 wrote: Why are those metal flakes not in the oil filter? I could be wrong but I think the oil pump pumps the oil through the filter on its way around the engine. The mesh screen under the pump stops these bits getting into the pump which would explain why the are all in the one place but the oil filter stops the finer bits. I think the oil filter has a by pass if its blocked. Is that really metal particles of copper or brass--or is it the plastic from the chain slider? It looks metallic in the photo but needs to be verified. Heavy metal like brass probably won't get pulled thru the pump, but aluminum or plastic might. There is a fine mesh filter at the bottom of the intake for the pump. @kennybob wrote: Is that really metal particles of copper or brass--or is it the plastic from the chain slider? It looks metallic in the photo but needs to be verified. See my post #5 above. At first glance, they looked metalic but I determined they weren't as it would break under my fingernail. They certainly looked like bits of bronze but I don't know of any bronze parts. I'm pretty sure they're from the timing chain tensioner guides. Any particles of a certain mass will settle in the bottom of the sump pan. Also the pre-filter on the oil intake will prevent larger particles from getting sucked up thru the filter.... so they are effectively trapped in the pan. just a thought here ...could this be flakes of aluminium off the block sheered off by the timing chain slop ? @charlie99 wrote: just a thought here ...could this be flakes of aluminium off the block sheered off by the timing chain slop ? Either way it points to a possible timing chain and tensioner issue. I would replace the chain and tensioner and guides all the bits. I would say definitely not aluminium. I had the same experience as the Captain. They are quite soft and picking them up in your nails is enough to disintegrate the smaller ones. I found it hard to get large enough pieces to pick up for examination. only other thought I had was ...perhaps some paint - stuff off the outside of the oil filter ? Not flakes of paint charlie. They're lumps. Will, strange how this has happened to two MarrakeshrRed K1100RS at the same time. Wonder if there are any others out there that have experienced the same. Well, I changed the timing chain and guides on the weekend (a little different to the K100). 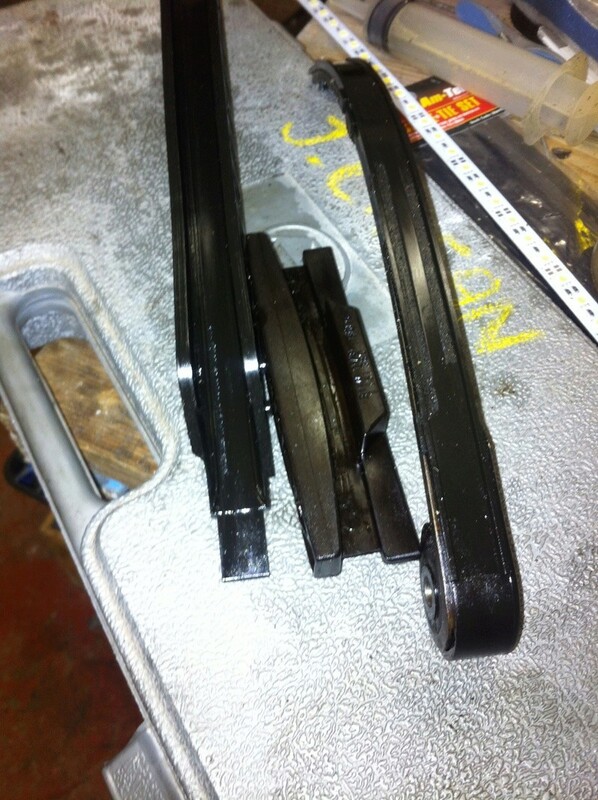 There was very minimal wear on the bottom tensioner guide and the rest was in good condition... even the chain. Nothing to suggest that the guides had been chewed out. Although there was no evidence in the records I got with the bike of the chain being changed, I'm going to assume that that work has been done in the last 20 or 30k or so and that these strange plastic looking lumps are remnants floating around the bottom of the sump from previously chewed out guides. Next oil change I need to remove the sump plate to repair the gasket there so I'll be able to clean it out properly. I'm guessing I'll find more strange lumps. I'm interested to hear what you find in yours Will. Well I changed the chain and guides/tensioner arm and could not see any source of wear that could account for what was in the sump. Judging by the condition of the guides I concluded that they were done at some point in the past and that the crud was perhaps there from the previous set. I can see or think of no other explanation. Here's what I took out...I know the ones on the bullion brick are far more worn and the chain on the RS wasn't that bad either. 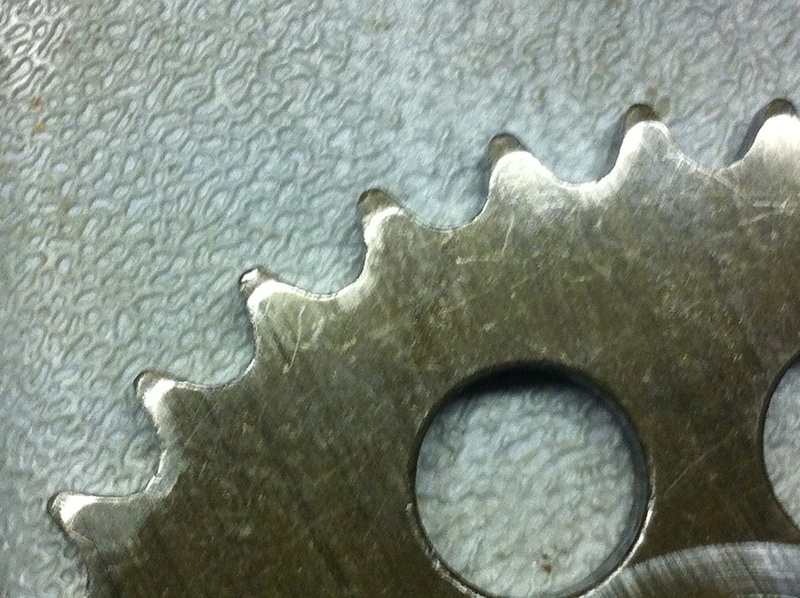 I also found some damage on the sprocket teeth, like it was dropped. I took this as evidence of work in the past too. I' d be guessing that the guide was using the roller of the chain rather the edge for tensioning on the arc tensioner guide ? how was the roller part of the chain ...any movement - slop in any of them ? 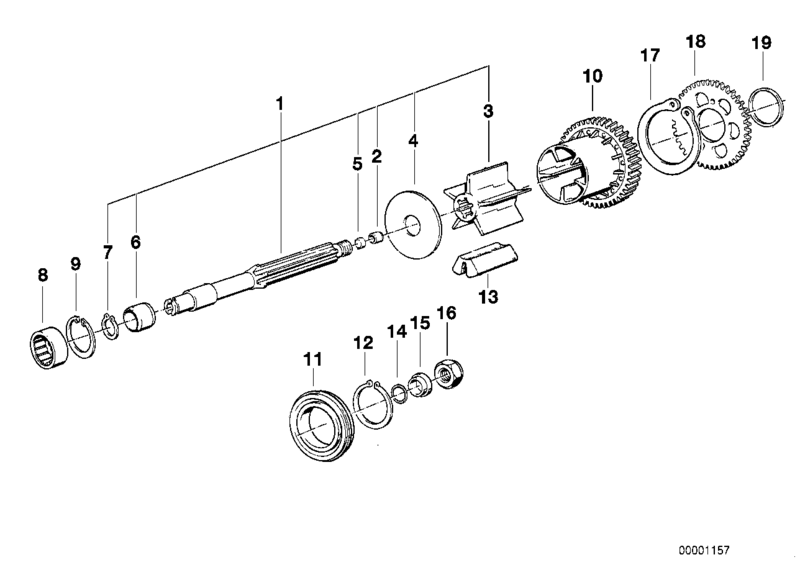 I still cant think of anywhere that has brass in the engine ...maybe except the front output shaft bearing surface ring(6) or the bush at the end of the output shaft (2) ? perhaps this is what is called fretting of some metal ....then over time ...well you can guess the rest ? ENDED = the part has been discontinued (no longer available). The tensioner guide wasn't down to the rollers Charlie from what I could see and the chain had very little variance from the new on a sideways bend. Still a bit mystified. » Del Potro - Djoko, is it a cupcake match for Djoko for Bronze?